Versital offer a wide range of marble alternative finishes for a variety of installation applications. Hand made faux marble surfaces in a large range of colours to replicate the most popular natural marble colours available. All Versital products are manufactured to order, therefore the cost of each project varies. For a personalised quote please send a marble substitute quote request. Alternatively please call 01204 380780 or send through a contact form. 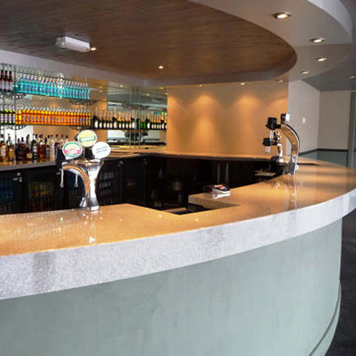 Realistic looking marble finish bar tops in a range of beautiful finishes. 100% waterproof and stain resistant. Ready to install. No need for masonry equipment. Very competitively priced against the real marble option. Matching marble table tops available – choose your preferred bespoke table size, or from our range of popular table size options. easy to clean, waterproof and stain resistant. View the Full Range of Marble Finish Colour Options. You Can Also Order Samples Free of Charge. Unlike natural marble, Versital is 100% waterproof and stain resistant giving it a distinct advantage. Use Versital marble surfaces wherever you would normally use real marble for a beautiful natural looking finish with the added benefits of being easy to clean, waterproof and ideal for wet situations. Versital marble substitute gives the option of true to life marble look surfaces, whilst remaining completely non-porous and stain resistant unlike the natural material. Design and install the look you want, without the problems. With natural marble there will always be variations in colour due to naturally occurring imperfections. 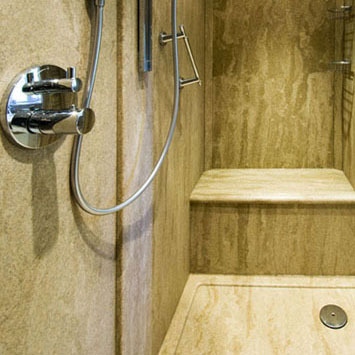 Versital is a hand made product that has the appearance of natural marble, but without the uncertainty. Versital surfaces are made to order to your exact specifications or designs. We can manufacture from your technical diagrams where required, or to exact size requirements. This makes installation simple, and saves on wastage. Being made to measure and to specifications makes Versital a cost effective option against natural marble. Versital surfaces are manufactured to spec, either from given dimensions or technical diagrams provided to us. We are happy to supply quotations from full technical drawings where requested. For more information on Versital substitute marble products, colour samples or a personalised quotation please contact us direct on 01204 380780. Unlike natural marble, Versital substitute marble does not require specialist equipment or masonry tools. Being made to measure you may not need to cut it at all! Ordinary wood working tools are all you need to cut and finish Versital marble. It also has the added benefit of being lighter than natural marble, making it much easier to move, transport and install. Versital manufacture to spec a wide selection of hand made faux marble finishes. The more popular marble substitute products are detailed below, but please contact us if your needs are different. Marble panels from Versital are made to your specifications. These panels can be used to clad the front of bars and can be backlit. They are ideal for point of sale locations and high end display cases for a marble look that is also non porous, hygienic and waterproof. 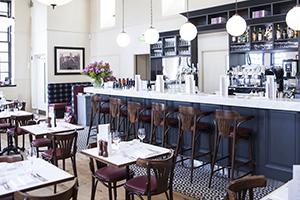 Versital marble lighting pendants are ideal for commercial installations including bars and restaurants. Available in a range of sizes and marble finishes as well as bespoke options. Ideal for numerous applications including marble bar tops, receptions desks, counters, or for display cases and point of sale. Marble tops are available manufactured to your design specifications, or to template. Easy to install – simply apply sanitary grade silicone and drop into place. Versital tops and panels are ideal for use with point of sale stands and sales points. Being hard wearing, 100% waterproof and stain resistant, it is the ideal surface solution where a marble or luxury look product is required. Versital marble finishes allow you to create fabulous marble bathrooms that are 100% waterproof, stain resistant and colour consistent. 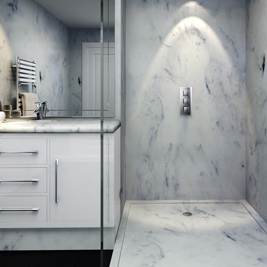 Versital marble finishes are available in a range of shower trays, shower panels, wall panels and vanity tops for a classic marble finish bathroom. 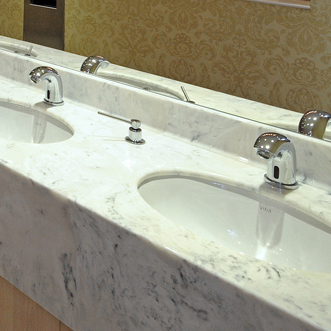 Made to measure marble vanity tops with multiple basins for public washrooms and bathrooms. 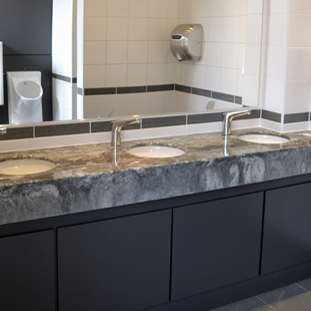 Create an impact with beautiful vanity tops that are easy to clean, non porous and 100% waterproof. 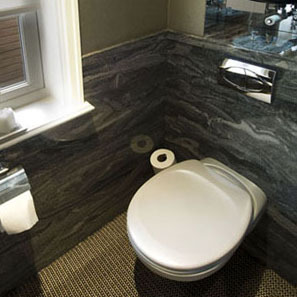 Versital Marble Surfaces Are Used In Many Types Of Installation. View the Image Gallery. 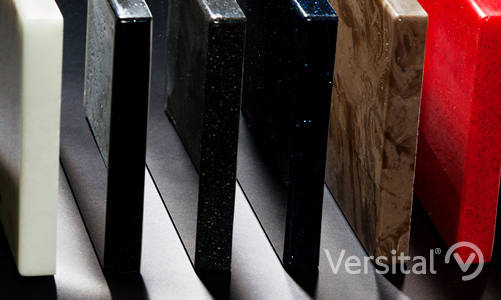 Versital offer a range of natural looking marble finishes, as well as granite and sparkle's. These surfaces are true to life colours whilst having the benefit of being waterproof and colour assured.